← Which is Worse: A Collapse Against the Red Sox or a Doubleheader Loss to the Yankees? The bronze baseballs that adorn Camden Yards’ Eutaw Street walkway provide four pieces of information – the batter, his team, the date, and the distance – but that’s only half the story. Who were the pitchers? Presumably, no organization would create a monument to shame pitchers, although if that option ever came in vogue I have some candidates in mind for the first statue – 2007 bullpen, I’m looking in your general direction. Nevertheless, there’s a curiosity factor there for me in this regard, so I reviewed the 50 Eutaw Street home runs to consider the pitchers who gave up the long home runs instead of the batters who struck them. Overall, the Orioles have served up 30 Eutaw Street home runs. No visiting pitcher has given up more than one Eutaw Street home run, but Detroit has been the most-victimized opponent. But which Orioles pitcher has served up the most bronze bombs? Answer provided after the jump. Sir Sidney Ponson has given up the most Eutaw Street home runs, a total of five. Jason Johnson ranks second with four. Three other O’s pitchers have been victimized twice: Erik Bedard, Jeremy Guthrie, and Radhames Liz. Consider this: Ponson alone is responsible for every bronze baseball from 1998 and 1999, which happened to be his first two seasons in the majors. (Ponson allowed a career-high 35 home runs in 1999). No other Eutaw Street home runs were hit between the time that Ponson allowed his first (to the Rangers’ Lee Stevens on May 30, 1998) and his last (to the Athletics’ Matt Stairs on Sept. 23, 1999). Average distance of the five home runs: 417 feet. The Birds’ Scott Kamieniecki allowed the longest Eutaw Street home run, Henry Rodriguez’s 443-foot drive on June 17, 1997. The Nationals’ Adam Dunn fell a foot short of that record last weekend, allowing rookie David Hernandez to breathe a sigh of relief. 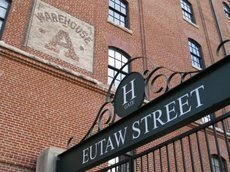 The record for longest Eutaw Street home run allowed by a visiting pitcher – 420 feet – belongs to five players: Detroit’s Bill Swift, Kansas City’s Jeff Suppan, Detroit’s Brian Moehler, Philadelphia’s Brett Myers, and Detroit’s Freddy Dolsi.